In Memoriam of Cardinal Cottier – Most Rev. Charles Morerod, O.P. Prayer and the Fundamental Structure of the Faith – †Cardinal Georges Cottier, O.P. Aquinas on the Spirit’s Gift of Understanding and Dionysius’s Mystical Theology – Bernhard Blankenhorn, O.P. God, the University, and Human Flourishing – Kevin O’Reilly, O.P. Christology in Context: Review Essay of Thomas Joseph White, O.P., The Incarnate Lord: A Thomistic Study in Christology – Guy Mansini, O.S.B. 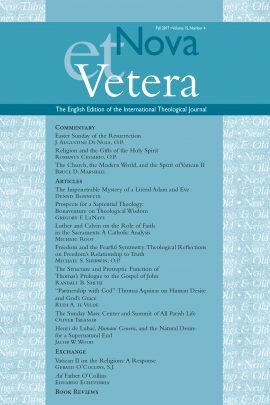 Be the first to review “Nova et Vetera, Fall 2016 (Vol. 14, No. 4)” Click here to cancel reply.